14 Sep :Hindi Divas was observed today. President of India, Smt. 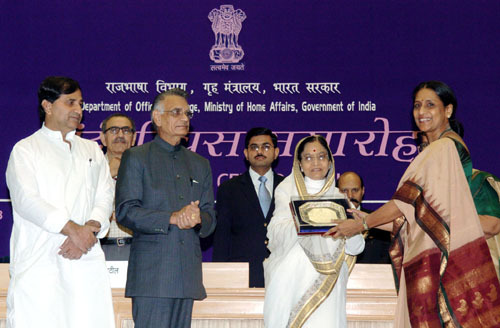 Pratibha Devisingh Patil gave away 45 prizes and awards including the prestigious Rajiv Gandhi National Award for Original Book Writing on Gyan Vigyan, Indira Gandhi Rajbhasha Award for Original Book Writing in Hindi and for excellent work done in Hindi in Central Govt. offices. Both the President and the Home Minister, Shri Shivraj Patil condemned the serial bomb blasts in Delhi yesterday and they expressed sympathy for those killed and injured in the blasts. In her remarks Smt. Patil said that such attempts by disruptive forces cannot dent the resolve of the country and national unity is the need of the hour. The President said that the official language can be further promoted when it becomes the language of the common man. Its simplification and the process of give and take vis-à-vis other languages can go a long way in promoting Hindi further. She felt that MNCs and the process of globalization have opened up new avenues of recognition for Hindi language. The writers as well as publishers should make earnest efforts in bringing out excellent and inspiring literature in Hindi. (full text of President’s speech is available on website presidentofindia.nic.in. The Home Minister Shri Shivraj Patil in his remarks said that the Government will never let the plans of anti-national elements succeed and will keep working towards thwarting any attempt to disturb peace. Appropriate action will be taken against those responsible for yesterday’s blasts in Delhi and due support would be provided to those affected, he added. The Home Minister said that language has always been a unifying force and the Government is promoting all languages. Hindi being the language spoken by majority of Indians and the Rashtra Bhasha, continued efforts have been made to make it simpler and easy to adopt. The launch of new software would help further develop and promote Hindi. He assured all Government support in promotional efforts by the department. Shri Patil felt this language can achieve its higher position only when the respect towards it deep-rooted in our hearts. Shri Patil said that the Government is making efforts for recognition of Hindi as a language of United Nations. MoS Home, Dr. Shakeel Ahmad in his welcome address said that Government of India is keen to promote Hindi but the objective can be achieved with the support of all those who are working in this field. The Department of Official Language in the Ministry of Home Affairs is responsible for policy formulation and implementation as per the provisions of the Constitution in regard to Official Language. It has been the motto to propagate the use of Official Language amongst the employees of the Central Government, Public Sector Undertakings, Corporations, Banks etc. through encouragement, persuasion and goodwill. Three Softwares namely, ‘Vachantar’, ‘e-Mahashabdkosh’, and ‘Mantra were released on the occasion. To modernize the training system and language learning process these Softwares have been developed with the assistance of C-DAC, Pune. These are primarily in the fields of Hindi Teaching through various regional languages, (Lila series) translation from English to Hindi (Mantra) and automating typing out of Hindi dictation/ speech (Shrutlekhan) on the computer. E-Mahashabd Kosh a bilingual, bidirectional dictionary with pronunciation and usages etc. is also being developed by DOL and C-DAC. Continuous efforts are made to improve these language application tools based on the feedback received from the users. Publications brought out by the Department of Official Language are another important instrument in the field of publicity of Official Language..